I have a new goal of monthly blog posts… again. Let’s be honest: are we trying too hard to resuscitate a dying medium? Either way, I loved following all of my internet inspirations back when I was getting into the sport in 2012 and found it helpful to follow the ups and downs of the bloggers and athletes I followed. I looked forward to emptying my google reader each week, especially at the start of race season, hoping to learn a little something myself. Honestly, if I had all the time in the world, I’d dedicate actual time to this, whether sharing my Sunday meal preps (my new savior the last few months) or detailed recaps of day-to-day training. I was a “journalist” in college, so you could say the urge to write and to document is still strong. The reality is I’m working 40-50 hour weeks, scraping by with my weekly workouts (missing more than I would like to admit) and my house is a literal mess, aside from some aggressive Konmari’ing that happened in the first two weeks before I got sick. Social life? Non-existent. And oddly, I’m okay with that. So I’m sorry you’re stuck reading the less-than-helpful down down up down down up up down of the last 4 years ever since I took my elite card. I hope this is the year that pattern turns around. This first month of 2019 has been about retreating a bit and focusing on myself. I had one week where I travelled to California for work Monday - Wednesday, flew home late that night and arrived at a client down in Denver the next morning, less than 6 hours between arriving and leaving. Naturally, as someone who lives in the kid-free Boulder bubble, I got deathly sick. There are few worse ways to start your year than a 9 day stint spent mostly in bed or on the couch with the flu. So I became a hermit mid-January and just maintained the trend throughout the rest of the month as I recovered. As a result, I got a little stir-crazy and found myself in a little bit of an internet tiff this week—though as an opinionated individual, that’s not an entirely new thing—but I found it annoying that athletes today are policing whether other athletes should be able to call themselves a “professional triathlete” based on their financial earnings in the sport. I probably took this a little more personally than I should have but literally every new or aspiring professional triathlete that has ever reached out to me in the past four years (~7-8?) has mentioned that she was worried about not fitting in, or that she did not “belong” in the professional ranks (it’'s always a she, isn’t it?). And yet at the same time we have seen more male triathletes taking their (rightfully earned) pro cards without hesitation and the occasional pro race where the women’s field is not as deep as expected. I think we’re seeing a full-blown case of professional female imposter syndrome and we need to do more to support women taking the leap. (BTW, I think I may be the poster child for “amateur who turned pro but kept her day job and has maintained spotty and/or back-of-pack results since”… feel free to reach out to me if those are your lowly aspirations: I have plenty of feedback, both good and bad). I myself have felt the very same, and struggle with the sense of belonging. The interesting thing about being a back-of-the-field female pro is that you don’t feel like you belong in the pro ranks, but also feel like you would not be welcomed if you dropped back down to race amateur: literally living in no-woman’s-land. I haven’t yet renewed my USAT pro license for 2019 so still have the option to race as an amateur—but I’m committed to racing pro in 2019 once I free up enough time in my schedule to submit my results to USAT. saves you money: ~$1000 for the year versus $3000+ if you like to race as frequently as I do. And that’s not even counting home stays, which I have yet to do. You fail quicker and faster. And get better as a result. As tough of a pill as this is to swallow, this is a wonderful thing. The most athletes who I see not cut it in the professional ranks are those who cannot acknowledge and learn from failure. That last point is key. I have come to embrace that “failure” is a faster method of evolution and growth, as long as you learn and adjust accordingly and are not too hard on yourself. Even though I only got to toe the start line for two triathlons and one mountain bike race, my 2019 was a terribly rough yet wonderful year of “evolution” on all fronts: athletic, professional and personal. And I’m a better person because of it. At the end of the day, I think we all rise to the expectations that we set for ourselves, or that others set for ourselves. I’ve always performed best when I or my coaches have expected the best from myself and my performances. While realistic can often be good, I think it sometimes sets an upper limit on what is possible. As an aspiring Professional, whether capital P or little p, whether in work or on the race course, we can learn the most by being the right ratio of realistic and ambitious that keeps on moving forward as much as possible. I’m stubborn and want to keep my weekly blog going, instead of just fizzing out once again. I figured since the instagram #miniblog is en vogue, I’d borrow and repurpose that concept to re-share my latest thoughts from the ‘gram on turning one year older after a tumultuous last 12 months. Also, if you’re not following me on Instagram, you might as well go fix that. I like spending my birthdays doing something challenging and, as I’ve come to learn, prefer tackling these adventures alone. It gives you ample time to reflect on the past year’s lessons and start dreaming up what’s in store for the next 365. This birthday tradition started a few years back, with a standard HPB-assigned 100x100 birthday swim. Soon after followed 128 mile and 129 mile rides for my respective 28th and 29th birthdays. Last year it was a crazy mountain bike ride up Kenosha Pass. This year I was worried my birthday adventure would be a little boring, thanks to a recovering broken ankle, but Lucy and I have been hiking a lot for rehab, so a double 14’er sounded like just the right adventure to take on. For the uninitiated, a 14er is a mountain that peaks over 14,000ft; there are 58 in Colorado alone. I had one under my belt and wanted to add to my list. Lucy and I started at sunrise to hike up Grays Peak to 14,278’, where we took our obligatory peak-bagger photo, before walking down, across and up a steep ridge to Torreys Peak at 14,275’. Six hours of hiking, scrambling and tail wags later, let me just say: Colorado, you are might pretty. Looking back, thirty came and went with plenty of struggles and set-backs, but also some new adventures and significant growth. It felt a little like a two steps forward/one step back kind of year. Here’s to more leaps forward this upcoming year, because I had a full day of dreaming and scheming and planning today and let me tell you, thirty-one sounds great. Why Your Desk Job is So Damn Exhausting. Oh. Also, I don’t know what episode but there was also a really great podcast by Sonya Looney and she talked about setting parameters on when she did “work work” leading up to a key session or race. As someone guilty for working a full 8-hours remotely the day or two before an Ironman, I think it’s time to reconsider my strategy. If you’re into hiking adventures, one really good book, apparently also a movie, about tackling the Appalachian Trail. It will simultaneously inspire you to tackle the AT, while at the same time suggesting it’s a terrible idea. How Being Judged Affects Your Work As I read this, I could not help but think about it in the context of triathlon coaching. Several friends are coaches, while many friends are coached—and lots of stories from both ends of the experience spectrum. Timely, given I received a “rockstar” rating during my work review last Friday (after the past six months spent feeling like I was struggling) but why feeling like a fraud can be a good thing. (Not Yet) but I picked up Kara Goucher’s new book from the library last week. A quick flip through and it looks to be a little light in terms of anything outside of pretty pictures and journal prompts—but I’m still hoping to be surprised. I intended to make this for next week, to make good use of all the corn I got from the Boulder Farmer’s Market this past week—but that has not happened yet. Stay tuned. Also, can we talk about shishito peppers? New obsession (side note: this section is really only here to inspire me to try new things… so I’m all ears for any new suggestions). Working. A lot. I’ll be heading to Denver next week to demo what I’ve spent the last two months building and agonizing over, and it will be launching to the public in a week. I got a massage last Friday and my guy was pretty much like, “dang girl, you are definitely stressed about something!” I’ve also been tackling daily PT exercises that include a lot of single-leg actions because, apparently, I need to re-learn how to walk and run again. More on that in a later post. After I found out I broke my ankle, there was a 10% chance I would be able to still race Ironman Wales (this upcoming weekend). I took my doctor's very hesitant prognosis and got inspired. I ran (well, hobbled) home and started researching all of the ways to speed up the healing of a broken ankle. Or, at the very least, how to ensure my best odds of a successful recovery. Below, I outlined a number of strategies I tried to give myself the best shot at healing quickly. While (spoiler alert!) the body had different ideas and I'm still at least 1-2 weeks out from running, I believe the strategies below helped heal relatively quickly/correctly and gave me something to strive for while my triathlon goals were put on hold. Keeping me sane during this time has been a refocusing of my goals and not worrying about not being able to run or bike or even keep up with my lane mates—but focusing on the little things that I could keep in my control. In a way, this is the complete opposite of the typical way I approach triathlon (I'm great at executing the swim/bike/run portion, but try to get 8-hours of sleep and do all of the small yet critical things? Not so much). If there was ever a silver lining to this injury, it was that it has taught me how to treat my body during times of stress. Maybe you don't have to wait until you're sidelined with an injury to have that knocked into your head—at least, for your sake, I hope you can learn a little from me. Nutrient Rich Diet: Focus on lots of nutrient- and anti-oxidant rich foods. Research the AIP diet (auto-immune protocol) and get some ideas for ways to decrease inflammation while allowing your body to heal. While I didn't stick to this 100%, I did use it as inspiration for ways to focus on ways to heal naturally and maximize my healing through nutrition. For me, this included extra protein, bringing more colorful veggies into the house and a focus on Calcium, Vitamin D and Iron supplements. I am usually wary of supplements and even usually failed to take my daily Centrum multi-vitamin prior to this, but I made it a priority during the healing process. Although I typically don't drink milk or eat yogurt, I added them back in during this time. Feed your body: This one was hard, as I was well aware that I was burning far less on a gimpy leg than my previous 18-25hr training load. But it is still critical to make sure you are giving your body enough calories to promote the healing process. So while I certainly didn't lose any weight while injured, the few extra pounds were worth the peace of mind that my body had what it needed to heal. Avoid Ibuprofen: (Or any other anti-inflammatory drug for that matter). These both delay healing—some natural inflammation can be good in the repair process!—but also limit the amount of feedback your body can accurately provide if you're just shutting down your pain signals. Quality Sleep: While I can't say I hit the gold standard of 8-hours each night (thank you, crazy workload), I did try to prioritize sleep. As we all know, this is critical healing time and should be a non-negotiable for anyone looking to maximize their healing and recovery, whether from a broken bone or a 5-mile run. Exercise/Movement: Yep, you heard that right: surprise, surprise - injured people don't have to spend 5 weeks parked on the couch! Shortly after I joked about screwing a bike cleat into the bottom of my boot, someone posted a (likely unrelated) tweet shaming people trying to exercise while still in their boot. Well, for starters, you likely don't know the specifics of their injury (e.g. weight bearing was not an issue for me—I just couldn't re-roll my ankle for fear of undoing the damage, hence the boot) and, secondly, the more you can maintain or increase circulation and (doc-approved) movement, the more quickly and correctly your injury will heal. I'm not saying this is for everyone, but odds are that if the person is in a boot, getting the heart pumping and the blood flowing is not a bad thing. Make your life easier: This comes in a variety of solutions: I kept a chair in my shower (will definitely be setting this up the night before each Ironman from here on out! ), I brought everything I needed upstairs from my bedroom at the start of the day so I could avoid trips up and down the stairs, I wore a running shoe (Hoka!) with semi-equivalent height to my boot, even while puttering around the house to avoid any imbalances. Treat Yo Self: Similar to the above, but don't forget to take care of yourself while down. For the first week or two, I got my groceries delivered and ordered delivery (thank you GrubHub!). I hired a cleaner the second week to do a one-time clean and handle the things I could no longer easily do myself. I also enjoyed a few epsom salt baths and Amazon'd a few new books to keep me entertained during my down-time. Limit Alcohol: Said to also inhibit healing, plus if you only have so many calories in the day, you'll want to focus on adding quality and the nutrients suggesting above, rather than filler junk. Limit Excess Coffee: It's both dehydrating and could affect Calcium levels. I wasn't so sure about this one (thanks Dr. Google), but figured I'd still limit my caffeine intake and stuck mostly to green tea during this time. Plus, it's not as if my stress and cortisol levels couldn't also use a little coffee break. Collagen/Bone Broth: I've read a lot about the ways additional collagen (whether via bone broth or the powdered supplement) can help promote tissue and bone growth. I added in both traditional bone broth as well as some of the unflavored Vital Proteins powder that you can add in your tea or water. I also got my hair cut last week and my stylist said it was the healthiest she had seen in the last few years, so at least something good definitely came out of it! Challenge Yourself in New Ways: One thing I haven't done in years? Any significant upper body strength. While there were a few limited lower body exercises I could still do, I found the best way to keep me motivated was to keep myself challenged and that was by moving my body in different ways. I took on an upper body and core routine and was the crazy person hobbling around the weight room in my boot doing a lot of seated or standing upper body moves. Quantum Healing Meditation: Yep, you heard that right. I figured this one was more on the woo-woo end of the spectrum but since I was already spending time meditating daily, I figured it wouldn't hurt to spend a few of those minutes imagining my bones and ligaments healing themselves. Some say thoughts still can promote certain chemical reactions in your neural pathways... kind of understand, kind of skeptical, but really no hard in a few extra calming minutes of daily meditation. Read more about it here. No Smoking: Well, duh, you shouldn't be doing that anyway—broken bones or not. Things I didn't do, but wish I had: access to a bone stimulator or other more high-tech ways of healing, acupuncture (I had it on my list but never got around to it) and access to an alter-g instead of my aqua-jogging. If anyone else has anything in their healing toolkit, whether for a broken bone or just smashed legs after a hard week of training, I would love to hear it! My goal is to add it to the list, as well as to my list of "new habits" that I get to take away from this recovery process. Full disclosure: earlier this spring, I made a half-hearted attempt to restart the blog, with the goal of weekly posts. I made it a whopping two posts. You could say I'm attempting the same thing now, a few months later. Sometimes it just feels good to put thoughts to pen to paper. Either way, no promises. Just over five weeks ago, I broke my ankle. After several weeks of my best ever training, I had put in several 7-hour days on the bike and that very day, I ran a total of 22 miles, plus an easy swim, and felt amazing throughout. I have never felt more confident in an Ironman prep than I did those last few weeks, and Ironman Wales was still over eight weeks away. It's my kind of race and I was already ready. My goal was top five. I was just about to tuck myself in for an early bed that Sunday when I took Lucy out for one last potty time. In the condo where I'm living, I don't have a fence, just a few little flagstone steps out to a common shared area. I leashed Lucy up, walked her out and tripped over one of the big steps out to the grass. I went flying, completely bruised my left side and startled Lucy (she ran off—but not far), and heard/felt a very loud and painful pop from my right ankle. After some screaming and lots of sobbing, I crawled on my hands and knees down a flight of stairs and went to bed snuggling a bag of frozen peas. The next day, I tried to stand to get out of bed and immediately fell down into a worthless puddle. I couldn't put any weight on the ankle but figured it was a really bad sprain. Still, not one for excuses, I thought I should just go "get it checked out" before I had to email Michael to let him know I skipped the easy bike on tap that morning. There wasn't a lot of swelling. I could kind of/sort of walk on the edge and so hobbled my way to an urgent care doctor the next morning, driving with my left foot, about 7 Advils deep (next time I'm calling a friend or taking an Uber). The initial exam was fine and no big deal based on my pain levels; everything I told the doctor pointed towards just a sprained ankle and quick recovery. So I was in shock when the radiologist told me I had broken my ankle. Knowing my high pain tolerance, I should have guessed better but I didn't start crying until I left the office and got back to my car, now with a temporary fiberglass cast cutting off circulation to my right foot and a pair of crutches to help me get around. I didn't start calling doctors until later that afternoon; I was still heavily in denial. Thankfully, I managed to roll my ankle inward, versus outwards—which is what 99% of people do (clearly I'm special). Because my avulsion fracture was of the medial malleolus and not the lateral side of the ankle, my doctor said I didn't need surgery. Had I fallen the other way, I would have needed surgery and it would have been a much bigger deal. #silverlinings. 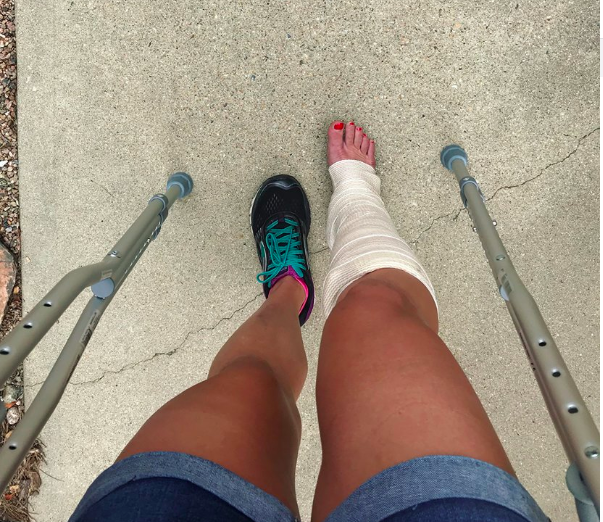 Two days later I made it to CU Sports Medicine and got a second evaluation and left with a boot and what felt like a life sentence: 4-8 weeks in the boot and no running, biking, hiking, leaping—pretty much everything that brings me joy, you name it. But I could swim! So that's what I've been doing. Plus some pool running and some lifting and this week I started to take my boot off and try to bike (in a brace) and hike and will be working on strength exercises to ease back into running. I am already a master at modifying exercises to be single-leg-friendly (hint: a bosu ball is key). So yet again, I am starting from zero. I debated sharing my story this time around, but I know that we all tend to share the gold-tinged experiences—the smiles, the podiums, nothing but the good times. To be honest, the last few weeks have sucked—big time. The accident has been isolating. I've dealt with some serious depression. I've thrown away hundreds of dollars due to the accident (hospital bills, cancelled race flights, unused coaching bills). I got bumped down to a slower lane at masters and at Siri's swim. I can't run and can barely bike right now. .I took all of my progress the last few months and tossed it into the flaming dumpster. A few weeks back, I showed up to swim practice after a short break and Michael joked that he "missed me". Honestly, my only response was, "I miss me too". Because you take someone away from something they love so much and something that makes up so much of their life and honestly it's debilitating. I don't recognize myself without sport in my life. I watch everyone with the consistent builds, the high TSSs and productive off-seasons and kick myself for one freak injury after another. I keep telling myself: at least my set-backs have not been chronic injuries? It's been stitches from a bike crash, a weird slipped saddle and subsequent hamstring injury, a broken ankle... walking the dog of all things. I try to stay positive and focus on the fact that this last incident has taught me to treat my body more carefully and to take my vitamins, add the protein powder to my smoothies, get eight hours a night, meditate a little more and stress a little less. So once healed, can I be more confident in my come-back? I'm hoping so. Either way, if anyone knows any ways to human bubble-wrap people when not training, I'm all ears. Let's add it to the ever-growing arsenal. Thankfully you can still cheer while injured: spectating Boulder 70.3 instead of racing. "‘Should I Quit My Day Job to Write a Book?" - except replace with "turn pro", "start a full-time blog", "become a triathlon coach"
"Habits of Highly Effective Athletes: Stay in Your Lane" ...duly noted. "You’re not world class if you’re not actively about inclusion." Steph Curry on empowering women and girls in sport. "How to Turn Your SUV into a Camper" Wanderlust and car camping is on my mind. Maybe I should just buy a tent? Something amazing I've been doing for the last few months is making more meals in advance, whether actual meal prep, or just a buffet style prep where I cook rice, roasted veggies and chicken ahead of time so I can throw together a quick and healthy meal during or after a busy day when needed. Most often, I try to set aside two hours on Sunday to make a few days worth of meals (typically three) and it usually includes overnight oats, a salad and then a dinner. This week it was: Roasted Cauliflower Salad with Chick Peas and Lemon Tahini and Pineapple BBQ Chicken with Broccoli and Coconut Rice. Both are A M A Z I N G. The first is vegan, btw, if you're into that. Last weekend I got to crew for two friends racing the Leadville 100 Run and met a few awesome internet friends in the process, but other than that... not a whole lot. However, I did start back with my coach and structured training this week and Sunday was my first time on a bike since the accident. It was painful but boy does it feel good to get out. I have a whole lot of PT exercises to keep me entertained and I've weirdly been enjoying a lot of rowing and strength training, since those are some of the things I can do without bothering my recovering broken ankle. My strength training had been spotty prior but honestly I have I loved it so much, I can see that being a practice that sticks around, even after recovery. See—silver linings to an injury!? Thanks for reading! I'll see you next week... or maybe not.